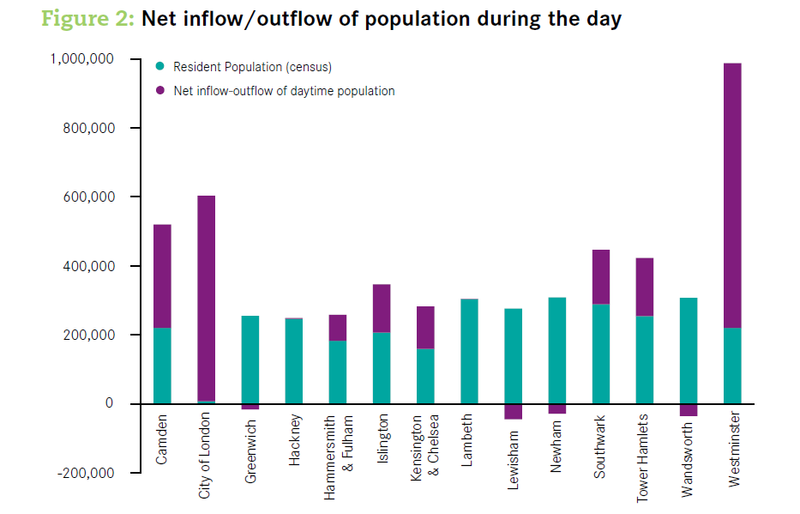 Inner London’s economy: What does it mean for Lewisham? 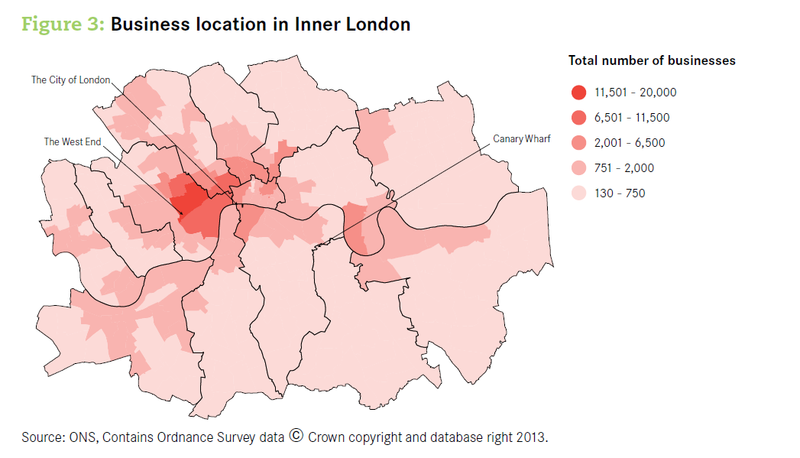 The Centre for Cities published a report entitled Inner London’s economy: a ward level analysis of the business and employment base in October 2013. 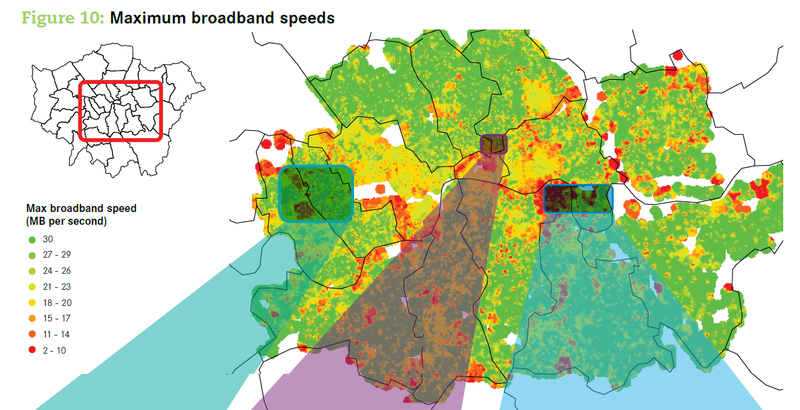 It doesn’t look particularly encouraging for Lewisham, as in the following illustrations. Their Figure 2 shows that the population decreases during the day, implying that people go elsewhere to work (or perhaps study). Figure 3 shows no sign at all of any concentration of businesses that might serve as a nucleus for further developments. Similarly, Figure 7 shows a rather limited number of start-ups. 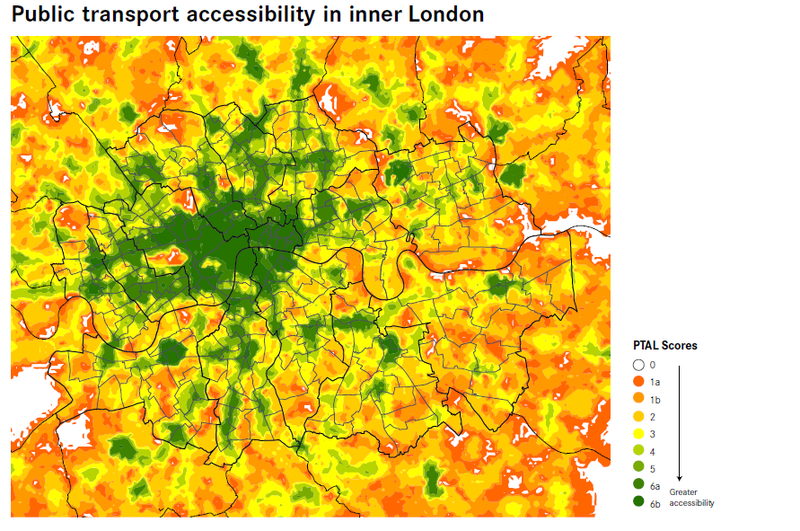 This may be explained, at least in part, by Figure 9, which shows that the accessibility of public transport is far from great. So in conclusion we get a picture of Lewisham as somewhere people live so that they can work elsewhere but the state of the transport links means it’s not too easy. That sounds like many parts of London in the 1970s: a decaying nowhere, but surprisingly close at hand. To be optimistic, it may be that even a slight improvement in transport will mean a substantial increase in house prices for Lewisham residents, and an influx of employment so they don’t have to use the transport after all. Why are clothes so expensive in Russia? Taking Perm as an example–and why not–it says here that while most things in Perm are 1/2 or 1/3 of the price in London, clothes cost the same–I’d say that if you take into account choice and quality things are a lot worse than that for the Permians. So would this work in Russia? If you can buy stuff at Bangladeshi or Chinese prices and sell it at London prices while paying Russian rent and wages you should be able to make some money. I tried to think of what the problems might be specifically for clothing. For instance: you can’t get your stock from China to Perm the cheapest way (by boat), but that applies to anything else imported from China, so doesn’t really count. 3. 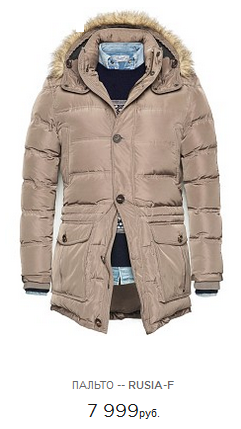 If there hasn’t been a proper fashion business in Russia then you won’t get a decent buyer. But if nobody else has one that’s not so serious. 4. I don’t think the shop units you get in Russia are generally anything like big enough. I’m sure there are enough disused warehouses and factories in Perm, but you’d have to spend some money on fitting one out. 6. I thought that there might be a steep tariff on imported clothes in Russia, but I looked it up and it’s pretty much the same as the UK. I then found a Russian-produced answer to my question that you can also view through Google Translate here. 4) they say that [the same as with housing in the UK] people expect to pay stupid prices. Of these, (2) & (3) are probably true but they would apply to all imported goods in shops and generally they’re not that dear in Russia. You do need more floorspace to flog clothes than some other things, but wherever you are you need to put some effort in to turning over the stock so that you cover your overheads. So we might say that unrealistic expectations are more a part of fashion than some other businesses, and that could be ‘the’ answer. Can’t say I’m convinced by the expectation argument. People are not perfectly rational, but they’re not stupid. With few exceptions (https://en.wikipedia.org/wiki/Giffen_good ) offer people better quality at lower prices and they will buy. The cost and supply side constraints sound a much more believable explanation. Thinking about this, if it was a case of expectations there should probably be a differential effect in different market sectors, which would be easy enough to check for. Offhand I think the answer is No. Otherwise the explanation has to show why clothes are different from other imported goods. So my current answer would be the combination of a) weakness in retailing (indolence, incompetence and shortage of suitable premises means they don’t shift enough stuff per square metre) and b) difficulties in importation (in particular, uncertainty in knowing what the Customs officer is going to demand and how long he’s going to hang on to your container–the official tariff is perfectly reasonable). Now under a) they manage perfectly reasonable supermarkets and rather nice chain restaurants at the Pizza Express-ish level and with sensible prices in both cases [but enough of the stuff is domestically sourced to make this not so difficult], while under b) the prices for say cars and computers are…tolerable (maybe 2/3 of the price here), but there’s not the same need to shift the stuff quickly I think. One problem with this explanation is that if you don’t believe in expectation based on UK/’Western’ prices, then a different set of factors is managing to reproduce them with surprising accuracy. Then you could ask whether all this means that home dressmaking is more popular in Russia. 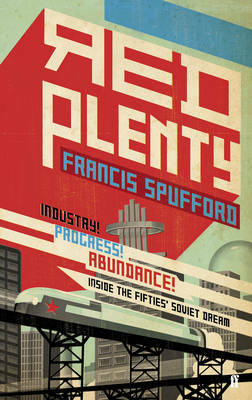 This book—a non-fiction novel—is about the failure of the Soviet economy to deliver the expectation of plenty. The genre is unusual enough, and this is a non-fiction novel not about a particular event or personage but about an idea, which is even more unusual. The book opens with Leonid Kantorovich coming up with the idea of Linear Programming on a crowded tram in Leningrad in 1938 and ends with him optimising the production of steel pipe to carry oil from the Siberian fields, since in the interim Soviet industry has failed and the country has been thrown back on exploiting its natural resources. The story is illustrated by episodes in the life of various characters: Galina, an ambitious Komsomol girl, is thrown off course after visiting the American exhibition in Moscow and ends up marrying a rather coarser careerist than she had hoped for. Volodya, her former intended, is sent to Novocherkassk to redeem himself and finds that things take a decided turn for the worse. Nikita Khrushchev is drawn into something he doesn’t understand and finds it turns against him. An economically rational price increase and finds it ends in bloodshed when accompanied by a cut in pay. A reform plan put to Aleksei Kosygin results in all the changes being adopted as long as everything stays the same. This is all very interesting from a number of aspects. It contains a lot of interesting and useful material on linear programming and analysis/management science. As well as linear programming, we learn about the importance of working ‘from the problem’ (asking questions and finding out what is really going on ) rather than ‘from the photograph’ (believing what they tell you). The 3% increase in efficiency is perhaps allowed and achievable as a one-off, but is never going to accumulate into qualitative change. Things can change—they must undergo radical reform–as long as they remain the same and nobody is alarmed too much. And the ‘method of balances’ for planning the economy does sound rather like HM Treasury at Budget time, though as ‘a very kind man’ Mokhov would be sadly out of place there. As a sketch of Soviet economic history I also found the book quite impressive. There are some reservations. The reason that Stalin’s shock industrialisation worked—that the whole thing came off—was that people were desperate to leave the countryside, as the Chinese are now. I think that the thing about products being valued by weight comes from one anecdote about a furniture factory, and I don’t really believe it in connection with heavy (heavy!) machinery. I think the reason the system finally became unworkable was that in the absence of coercive measures local managers had effectively privatised their enterprises, or at least the gains from them, so you had a centrally-planned system where the centre couldn’t enforce its will. The ‘supply agent’ Chekuskin also seems to belong to the chaos of the 1930s rather than to the 1960s and anyway bears too close a resemblance to Gogol’s Chichikov for comfort. As well as the narrative, the book comes with a comprehensive commentary explaining and justifying the narrative and an exhaustive list of references. The narrative stands as a foetus nourished by the parent body of fact through a placenta of commentary. In the narrative itself, you wonder about the characters—are they the progenitors of the thing that, like Lebedev’s lung cancer, nobody is able to cure, or are they just there to show how the thing affects their lives? I don’t think any of them are that interesting in their own right, independently of the point they’re meant to illustrate. But still, a very interesting, enjoyable and worthwhile book. Science fiction where economics is the science is certainly a new one on me! Looks like a recession all right! Andrew Dilnot opened the Annual Conference of the Royal Statistical Society’s User Forum by saying that ONS in Titchfield were the most beautiful and important people in the world. Charlie Bean (Bank of England) said that in dealing with the ‘Great Contraction’ of 2008/09, the MPC had used three sources of information: official statistics, regular business surveys and a network of regional agents with 8000 business contacts between them. They had got nowhere near predicting the 6% fall for 2008/09. Financial innovation had left risk concentrated in the banking sector. 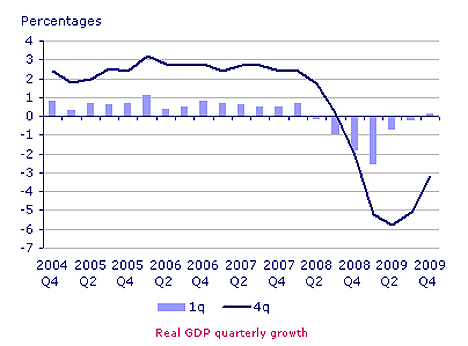 While the media liked to talk of ‘two or more consecutive quarters of falling,output’, economists saw a recession as meaning unused resources. The potential output was difficult to measure. If one assumed that in general potential output evolved smoothly through time, then output was at present 10% below potential. Previous banking crises had led to a 10% decline in output as against trend, lasting for 10 years. Going forward, one would need more flexible financial data collection for macroprudential policies to be used successfully. These presentation slides can be found here. Speaking on the media perspective, Michael Blastland said that it was marked by Aggregation (“It’s all debts innit?”) and Confirmation bias, whereby events were fitted to a default narrative based on folk memory of previous recessions. So you had various Winters, also Springs, Summers and Autumns, Of Discontent. Wage restraint, for instance, could be storing up trouble or an example of employer/employee cooperation, but in the media bleakness would be applied to everything. There was great use of expressions like ‘it was last this bad X years ago’, which could of course just mean there had been X years of uninterrupted growth. There was also the implausible conditional: if all the banks are allowed to fail…we’ll be reduced to foraging for berries [but there would be some policy response to stop themn failing of course]. As for the banks, the narrative was like: the money has gone–it’s irrecoverable–the debts must be cleared in full–we haven’t gained any assets. Stephanie Flanders had correctly noted that the ‘toxic assets’ weren’t made of plutonium, they just didn’t have a market-clearingf price at present. Ian Diamond (Aberdeen) spoke to ‘Recessions and their impact on society’, and said that it was very difficult, especially as you couldn’t do a RCT. The increase in unemployment had been less than might be expected. Those who were unemployed at 16-18 showed wage scarring at 23, recovery by 33, as small scar by age 43. The effect was less for the high-skilled. Lifelong learning improved wages and employment chances. Many companies had increased training as part of their ‘job hoarding’ activity. Poor economic conditions and low education were associated with crime. Wages at the bottom of the distribution were inversely related to crime. But it was more difficult to establish a direct crime-unemployment relationship. As for health, poorer health for the unemployed was well-known, but was this causation and anyway one had to remember the ‘healthy worker’ effect, whereby some of the unemployed were unemployed because they were sick. If one used Swedish data and worked very hard and controlled for confounding factors, one could show a relationship between unemployment and overall mortality and also suicide, but not mortality from CVD. In summary, there was evidence of effects due to the recession, many of them mediated by unemployment or other forms of income reduction. One needed the ability to construct large and complex datasets from multiple separate datasets. For the future, one would desire a cadre of methodologists, a community of analysts, and a quantitatively-literate population. On the role of Official Statistics, Stephen Penneck (ONS) said that gaps had been identified, for instance in liabilities to be included in the National Accounts. 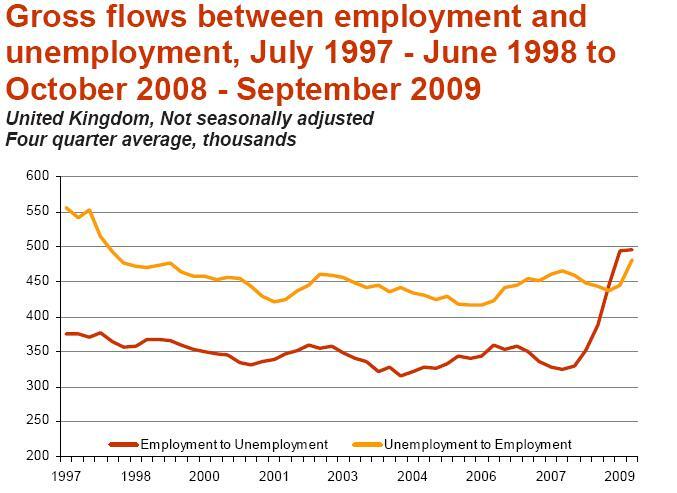 An analysis of labour market flows showed that during the recession the rate of people entering jobs from unemployment had remained steady; it was an increase in the rate of leaving employment that had led to the rise in unemployment. Now the rate of entering jobs was increasing. He felt that in the first UK recession for 20 years the ONS had responded well; but the jury was still out, and there was room for improvement. 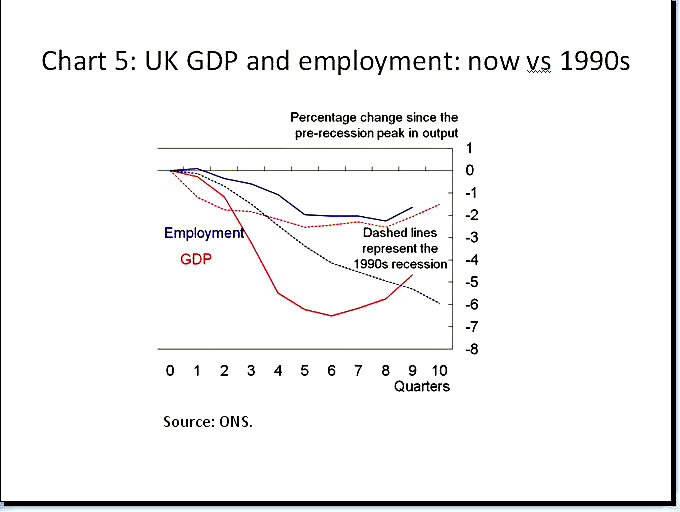 After lunch, in the parallel session on labour market statistics, Jamie Jenkins (ONS) said that GDP had gone down by 6% and employment by 4% this time. Total employment had been held up by an increase in part-time employment, which was entirely due to those who would like to work full time. The last 3 recessions had been rather different. In the 1980s the oil price shock and tight monetary policy had pushed down incomes. In the 1990s interest rates had been used to control inflation and there had been the ERM debacle and an impact on the housing market. In the last recession, demand had fallen sharply while inflation and interest rates remained low. Perhaps this time we had been spared a wage-price spiral and consequent damage to employment. Alastair Hatchett (IDS) said that in 2009 there had been a pay freeze in 1/3 of private companies and no freeze in 2/3; it was more like 20% with a freeze in 2010. The negatives had largely been concentrated in bonuses. Freezes had been concentrated in certain areas (for instance, cars and components, media)–this explained why one heard so much about them in the media. The median pay increase was 2% this year. Pay cuts were very rare. It made little sense to compare the public and private sectors directly–the public sector had a higher skill profile, 2/3 of public employees were women. The gender pay gap had narrowed during the recession, but would increase as public sector pay was constrained. From this talk, one got the impression that the problem with unemployment had been rather inflated in the media, and if you had some skills you had little to worry about. But there was a lot of underemployment about, and one reason that unemployment had been contained was that people had been very frightened after the Lehman Brothers collapse and prepared to take anything. 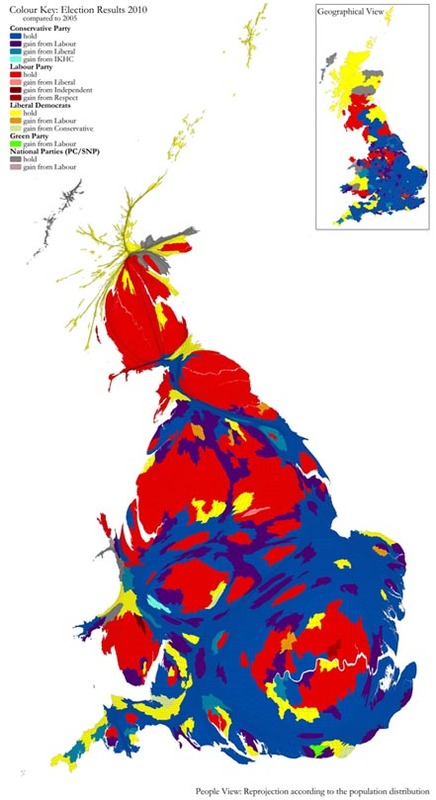 Danny Dorling (Sheffield) then showed many maps (or rather cartograms) to illustrate the geographical extent of the recession. Or rather, how things had been running up to the recession, since it was very difficult to get data that was both disaggregated and up-to-date. He said that London was young, so you weren’t going to get insolvencies there, and people were desperate, so they weren’t going to go on strike. The segregation index of Tory voters was at its highest since 1918. This was a problem for them because they were piling up votes in constituencies they already held, and soon enough demons would arrive and carry them off to hell. Geographically speaking, the difference between the elections of 1929 and 2010 was that London had gone Labour. Adults said that their well-being was highest in the home counties, while children seemed to have the best emotional health in the North, but Eric Pickles had just scrapped the corresponding survey. Many things depended upon exactly what questions you asked–volunteering was low in London, while civic engagement (which included things like going to a meeting and complaining) was high. John Fisher (Local Futures) then spoke about much the same kind of thing, but with less whizzy maps and frequent reference to Middlesbrough. He was keen on promoting Output Area Classification as a free, open and transparent geographic data system. He felt it was important to liberate and share locally sourced data. Stoke was going backwards fast, while there was a cluster of growth in Central England but he wasn’t going to say where. Carl Emmerson (IFS) wasn’t going to state the size of the hole in the public finances. There was extra structural borrowing of 5.8% of GDP or £ 86 bn. Better modelling and timely data would help. Treasury forecasts were overly pessimistic when the economy was improving and overly optimistic when the economy was deteriorating. At the end, Andrew Dilnot said that it was important really to find out what was going on, and really to understand it. People who came to meetings like this were felt to be peculiar, not special, but in reality they were both. 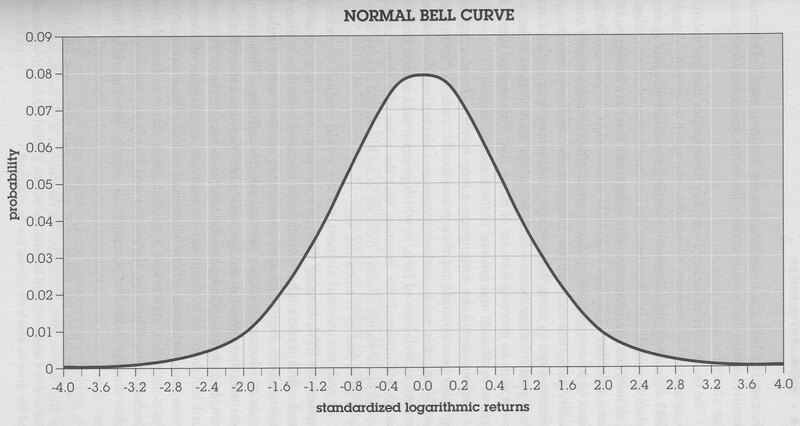 Well, not exactly, and the illustration (above) repeats the confusion and confounds it by suggesting that the distribution terminates at +4.0 and -4.0, rather than extending to infinity in both directions. …the system of disclosure that has worked so well with regard to traditional securities has not been able to do the job with respect to derivative contracts. To put it plainly, investors have a pretty good idea about balance-sheet risks; they are completely befuddled with regard to derivative risks. to infer that the fund was doing similar business elsewhere. And Lowenstein also states that the proximate cause of it all going wrong was things that had been assumed to be independent actually turning out to be correlated–just like the mortgage defaults in our recent sub-prime-initiated downturn.